McMinnville School District is accepting applications for a Nutrition Services Wellness Manager, Adams Module. The qualified applicant for the 4-hours-per-day position will be a dietetic technician with a minimum of an associate degree and at least 5 years of experience in school or institutional food service. The Nutrition Services Wellness Manager assists with education, research and communication of district wellness policy and applicable state and federal regulations, as well as menu planning, nutrient analysis and wellness compliance. The application deadline is now extended until the position is filled. Click here for details about the position and application procedures. 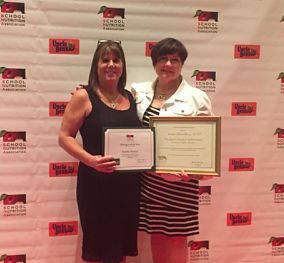 The School Nutrition Association (SNA) recognized two Oregon school nutrition professionals on July 12 at the 6 9th Annual National Conference in Salt Lake City, Utah. Cindi Hiatt-Henry, school nutrition director with McMinnville School District and Karin Nichols, nutrition manager with Sue Buel Elementary School in McMinnville, received national recognition for their superior accomplishments in the school nutrition arena. Nichols was presented with the Louise Sublette Manager of the Year award, which recognizes school nutrition managers for the contributions they have made throughout their school nutrition career. Hiatt-Henry was honored with the President’s Award of Achievement, in honor of Thelma Flanagan. SNA recognizes the commitment and dedication individuals who act that state presidents make to SNA, school nutrition and the children whom SNA members serve every day. Hiatt-Henry also accepted SNA awards for increased membership and certification on behalf of the Oregon School Nutrition Association, for which she serves as immediate past president. North Marion School District has announced a job opening for its Nutrition Services Director position. The qualified candidate will plan, organize, coordinate and supervise the operation of the District’s Food Service Program for over 1,900 students in four school buildings. The position manages a total of 12 staff and is responsible for providing appealing, healthy, nutritious meals for students, staff and other district events while maintaining compliance with all applicable local, state and federal regulations, and high standards of health, safety and nutrition. Click here to apply online. Applications are due by Friday, July 24.